Two years ago, at MWC, OPPO impressed everyone with its stabilized 5X optical zoom cameras, but the company never released any commercial versions. Meanwhile, a 10X optical zoom version is ready to be showcased at this year's MWC, and it looks like OPPO could actually integrate these lenses in some upcoming handhelds. OPPO showcased its 5X optical zoom prototype a couple of years ago at MWC, but the Chinese smartphone maker has not yet implemented it in any of its commercial models. 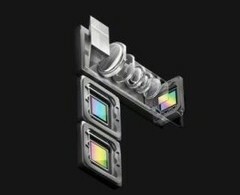 Meanwhile, it looks like OPPO went ahead and further improved the zooming technology, as the company just confirmed that it will showcase its 10X stabilized optical zoom at MWC 2019. The latest 10X zooming technology will still make use of the lateral width of the smartphone, so there will be no noticeable bulge around the rear camera. The array of lenses will provide the necessary physical depth through a periscope-style prism that will span along the width of the handheld. The new lens array has a focal length of 15.9 – 159 mm, so it initially provides an ultrawide perspective and zooms into a medium telephoto view. The lens array is said to be made of three prime lenses instead of one, so the “lossless” aspect may actually be a bit exaggerated. While the 10X lens array includes advanced image stabilization, OPPO did not mention anything about the aperture. Even though OPPO is ready to show the new 10X lens array at MWC 2019, it is still too early to tell if this new technology will make it in this year’s handhelds. Perhaps OPPO could add these new lenses to its upcoming foldable smartphones that will also be unveiled at MWC 2019.